Aucklanders and visitors to the city can now enjoy a free leisure precinct, including an outdoor gallery of works by renowned New Zealand artists, thanks to a major transformation project managed by RDT Pacific for Auckland Airport. The onsite component of the project began in March 2013, with the outdoor gallery being completed by spring. The last area to be completed – a sports field – was opened early in 2014. 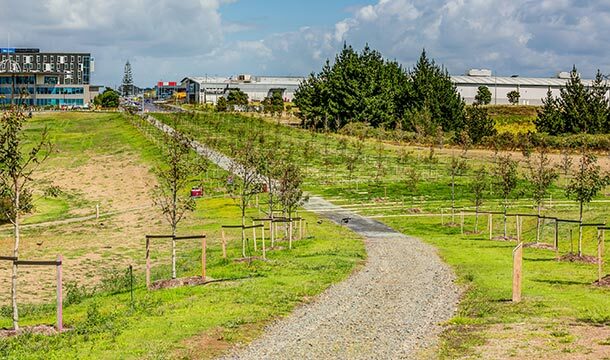 For the RDT Pacific team managing the project, the workload entailed design, procuring and constructing four separate projects – art trail, sports field, Tuwing sculpture, Airpark Drive – under one contract umbrella. Having two contractors on the same site and managing separate budgets against one contingency required RDT Pacific to set clear responsibilities when tendering the project between the landscape and civil contractors, with clear delineation of who is required to accept what work. It also entailed creating multiple cost reports each month culminating in an overall contingency for all four projects. Andrew Bell at RDT Pacific managed the design phase, procurement, construction, opening and costs – with the direct oversight of Director Simon Wilson. 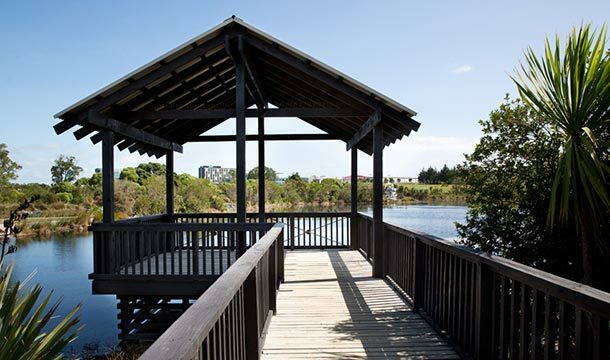 Called the Esplanade, the art trail has two parts – a tree and wildflower-lined path connecting Abbeville Estate and John Goulter Drive, and a trail with purpose-built seating, around the lake, and out onto a peninsula. 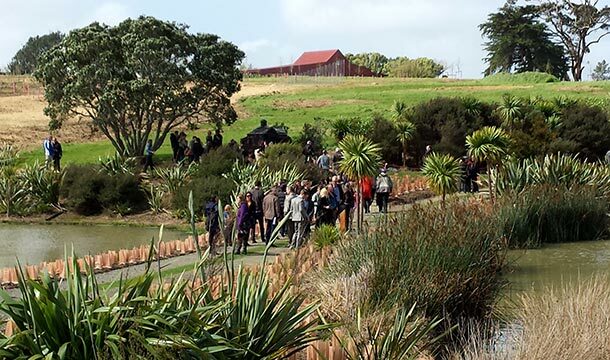 The works are displayed in landscaped grounds in and around a wetlands area, viewable from walkways. The project has given a new lease on life to a rarely-used paddock and a walking track that had seen better days. There are 10 sculptures displayed in the lake area, with other art installations throughout AIAL property including the kinetic Tuwing sculpture by sculptor Phil Price at the terminal entry roundabout. Despite its potential challenges, installing the Tuwing sculpture went smoothly, with RDT Pacific working closely with landscapers The Plant People. 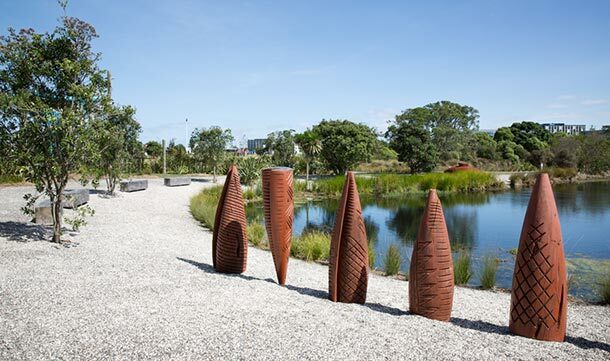 The sculptures encompass myriad materials and concepts, and were created by established New Zealand artists and fresh talent alike, including Greer Twiss, Fatu Feu’u and Gregor Kregar. Visitors can scan a QR code by each sculpture for information about the work and artist. The new park is a privately owned public open space, created next door to Butterfly Creek, and a mountain biking track has been created next door. “No ratepayer or taxpayer money went into this,” remarked Peter Alexander, the airport’s property general manager. The landscaping and pathway are already making the airport more pedestrian-friendly. The lake attracts native birds – an added attraction for people to spend time and relax in the area. Despite being privately owned and developed, it’s free for the public to use, and offers some excellent photo opportunities for weddings at nearby Abbeville Estate. The Art Trail and its surrounds are already making the Airport’s new business district a more desirable place to work and visit. The development is part of a wider ‘place-making’ initiative to enhance the cultural and social aspects in the area and establish The District at Auckland Airport as the city’s best working environment.